Seated Massage is a mixture of several massage techniques (Shiatsu, Acupressure and Trigger Point) targeting the neck, back and shoulders. It is a popular form of massage, especially for those who work in an office environment and are seated over a desk and computer for much of the day. 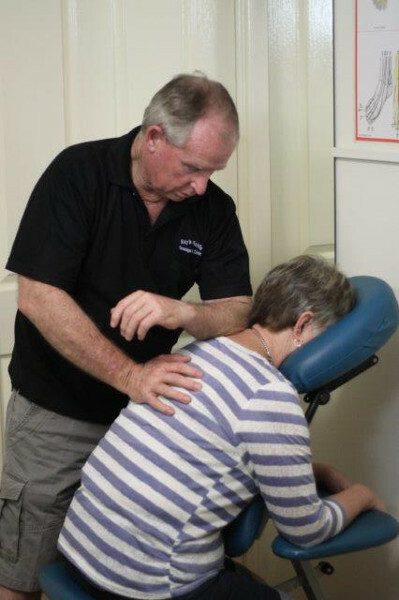 Clients gain relief from neck back and shoulder tension quickly with a standard 15-min seated massage or longer sessions allow for a more intensive sequence of massage moves to target key problem areas of the neck back and shoulders. Seated Massage is performed in an ergonomic chair situated within the work area or a separate office room for privacy. The unit takes up very little space and is designed for minimal disturbance in the work environment. All seated massage is performed through clothing, with the client remaining fully clothed for the session. No Massage oil is used. The massage chair is fully adjustable and is designed to suit individual body shapes including pregnant bellies! Improves and maintains the overall well-being of staff. Relieves stress & tension from neck, back and shoulders especially in this computer age. Decreases staff stress levels, mental & physical. Creates good relationship between management & staff. Boosts morale within the workplace. Improves focus & awareness in staff, thereby increasing productivity. Less absenteeism and less employee turnover. Provides opportunity to discuss ergonomic health issues with a massage therapist. Organise a corporate massage at work now and reap the benefits of happy staff and a healthier workplace!